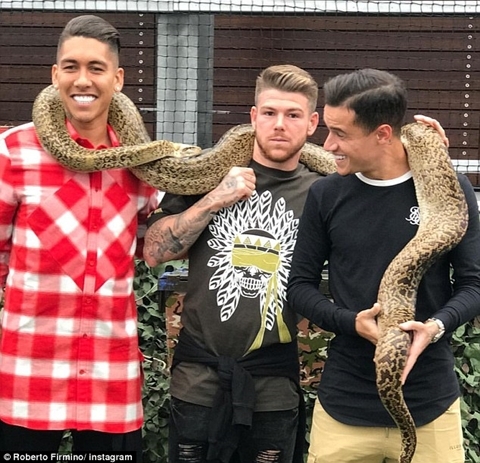 Liverpool trio, Philippe Coutinho, Roberto Firmino and Alberto Moreno pull faces of fear as they hold huge snake following Leicester 3-2 victory. Ahead of their Champions League game with Spartak Moscow, Jurgen Klopp treated his Liverpool players to a short break after their 3-2 victory over Leicester, but for Philippe Coutinho, Roberto Firmino and Alberto Moreno, it didn't appear as they enjoyed their time off particularly. 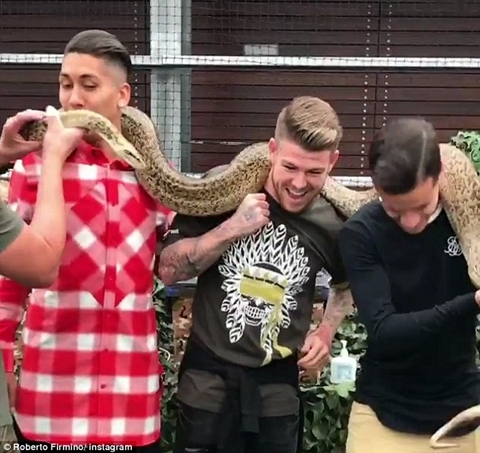 According to Dailymail, Brazilian midfielder, Firmino took to Instagram on Sunday to post a video and a couple of photos of a huge snake wrapped around their necks as they were supposed to be relaxing ahead of their European clash. 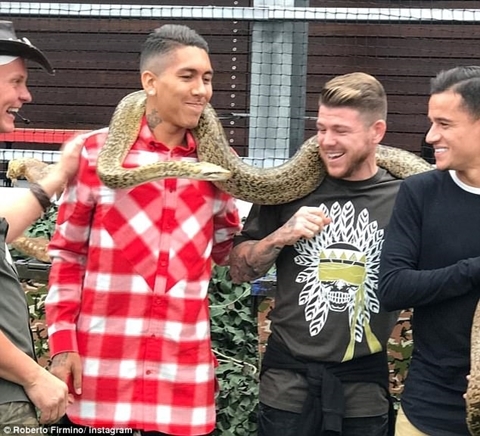 And it's fair to say that the Liverpool players were desperate to get the snake as far away from them as possible as they can be seen pulling frightened faces throughout the ordeal. Liverpool's entertaining win at the King Power Stadium ensured Klopp's side claimed their first victory since their 4-0 thrashing of Arsenal back at the end of August. The victory will give Liverpool a big boost ahead of their Champions League clash away at Spartak Moscow on Tuesday night. The Anfield outfit will be desperate to pick up three points following their disappointing 2-2 draw at home to Sevilla last time out in the competition.